OM3 and OM4 are two common types multimode fiber used in local area networks, typically in backbone cabling between telecommunications rooms and in the data center between main networking and storage area network (SAN) switches. Both of these fiber types are considered laser-optimized 50/125 multimode fiber, meaning they both have a 50μm micron diameter core and a 125μm diameter cladding, which is a special coating that prevents light from escaping the core. Both fiber types use the same connectors, the same termination and the same transceivers—vertical-cavity surface emitting lasers (VCSELs) that emit infrared light a 850 nanometers(nm). OM3 is fully compatible with OM4. With so many similarities, and often manufactured with the same color aqua cable jacket and connectors, it can be difficult to tell these two fiber types apart. So, what’s the difference between OM3 vs OM4? Do these two types fiber refer to the same thing? 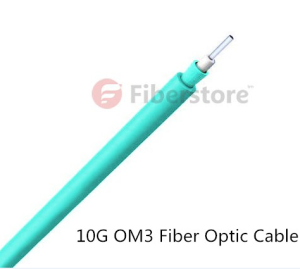 In fact, the difference between OM3 vs OM4 fiber is just in the construction of the fiber optic cable. The difference in the construction means that OM4 cable has better attenuation and can operate at higher bandwidth than OM3. What is the reason of this? For a fiber link to work, the light from the VCSEL transceiver much have enough power to reach the receiver at the other end. There are two performance values that can prevent this—optical attenuation and modal dispersion. Attenuation is the reduction in power of the light signal as it is transmitted (dB). Attenuation is caused by losses in light through the passive components, such as cables, cable splices, and connectors. As mentioned above the connectors are the same so the performance difference in OM3 vs OM4 is in the loss (dB) in the cable. 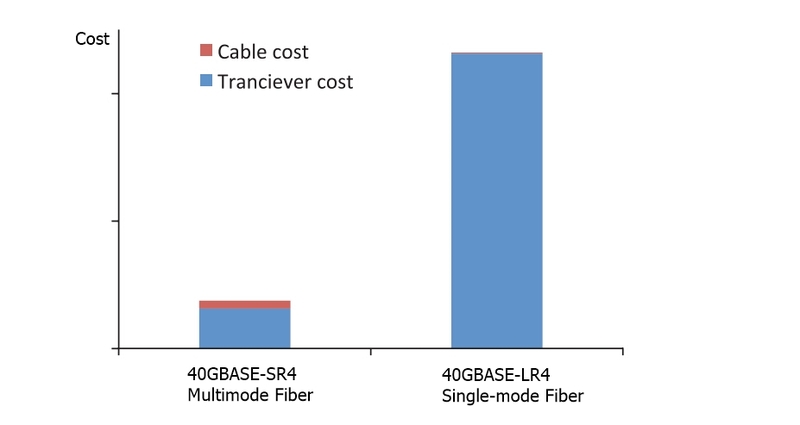 OM4 fiber causes lower losses due its construction. The maximum attenuation allowed by the standards is shown below. You can see that using OM4 will give you lower losses per meter of cable. The lower losses mean that you can have longer links or have more mated connectors in the link. Light is transmitted at different modes along the fiber. Due to the imperfections in the fiber, these modes arrive as slightly different times. As this difference increases you eventually get to a point where the information being transmitted cannot be decoded. This difference between the highest and lowest modes is known as the modal dispersion. The modal dispersion determines the modal bandwidth that the fiber can operate at and this is the difference between OM3 and OM4. 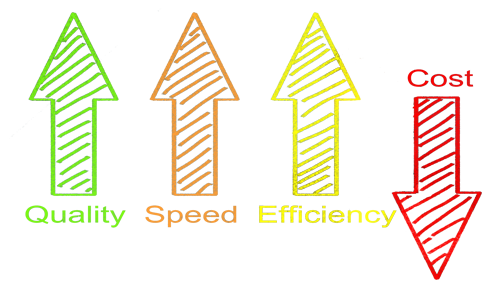 The lower the modal dispersion, the higher the modal bandwidth and the greater the amount of information that can be transmitted. The modal bandwidth of OM3 and OM4 is shown below. The higher bandwidth available in OM4 means a smaller modal dispersion and thus allows the cable links to be longer or allows for higher losses through more mated connectors. This gives more options when looking at network design. Since the attenuation of OM4 is lower than OM3 fiber and the modal bandwidth of OM4 is higher than OM3, the transmission distance of OM4 is longer than OM3. Details are shown in the table below. According to your network scale, to choose a more suitable cable type. Either OM3 or OM4 cable can satisfy your unique cabling needs. 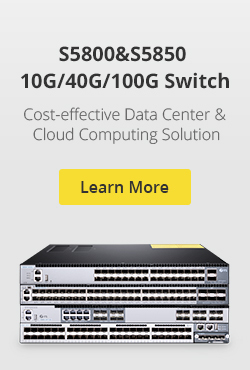 Just choose the most suitable one for your network to cost less and achieve more. Related Article: OM3 OR OM4 Cable Which One Do You Need? This entry was posted in Multi Mode Fiber (MMF) and tagged fiber optic cable, om3, om3 vs om4 on November 7, 2016 by Alice.Gui. Does Bend Insensitive Multimode Fiber Make Sense? As we all know, when optical fiber exceeds a certain bend radius, some amount of light can be lost, causing signal loss. This can happen during installation or anytime during fiber handling, and is often a concern within the tight spaces of high-density fiber patching areas in the data center. Today, a bend insensitive multimode fiber (BIMMF) was introduced, which can withstand tight bends, or even kinks, without suffering significant loss or any loss in a lot of cases. However, there are no standards around BIMMF and there are concerns about compatibility between BIMMF and traditional fibers. Besides, there are also questions around bandwidth measurements in the factory and actual performance in the fields. So, does BIMMF really make sense? Let’s find the answer together. What Is Bend Insensitive Multimode Fiber? Bend insensitive multimode fiber, first introduced in 2009, is quickly becoming the fiber of choice for high-performance enterprise LANs and data centers. With the introduction of BIMMF, installers were finally able to deploy fiber networks without fear of over-bending the fiber and degrading performance. Compared with standard fibers, BIMMF has a specially engineered optical “trench” added between the core and cladding. This trench contains the propagating modes within the fiber core, even in an extreme bend. It retains more of the light that would have escaped the core of a traditional multimode fiber. BIMMF enables more compact fiber management systems and to improve space utilization in modules, enclosures, cabinets and patch fields. Today, BIMMF is widely deployed in data centers and much has been published about its design and benefits. Is BIMMF Compatible with Non-BIMMF? The preceding core diameter and numerical aperture discussions revealed that there are mode-field shape differences between traditional MMF and BIMMF. These differences fundamentally reduce the match between these fiber types and can lead to elevated connection loss. However, modeling and testing on BIMMF has shown that an optimized BIMMF is backward compatible and can be mixed with non-BIMMF without inducing ex cess loss. There is also evidence that connector incompatibility and fiber geometry differences (core diameter) may cause direction dependence regardless of fiber type. In fact, according to most fiber manufacturers, BIMMF is fully compatible with OM2, OM3 and OM4 standards for laser-optimized multimode fibers and is also backward compatible with the installed base of non-laser-optimized 50µm multimode fibers. Except the compatibility of BIMMF, there still exist some other issues. All BIMMF designs exhibit a length dependency if an overfilled launched is used. Higher-order modes that get launched into the trench can remain there for some distance until they attenuate. These modes that are captured and propagate within the trench area are referred to as “leaky modes.” This phenomenon affects splice and connector loss. On the other hand, non-BIMMF does not have a length dependency. An encircled flux launch mitigates the core diameter and numerical aperture length dependency for all BIMMF designs. Further, an encircled flux launch accurately depicts the system performance. BIMMF allows cabling installers to deploy a network with less worry about inducing bend loss due to workmanship. Besides, it is also comparable and compatible with other non-bend insensitive multimode fiber such as OM3 and OM4. For proper operation of BIMMF links, either homogenous or mixed with legacy fiber, it is important to use a more tightly controlled launch—encircled flux. An overfilled launch will trap more high-order modes in the trench and performance will be compromised. With more and more fibers are being installed in smaller areas, requirements for a higher bend radius become crucial. BIMMF helps mitigate link failures when optical cables undergo small-diameter bends, particularly when applied in data center jumpers/modules and for high-performance computer applications, which really makes sense. This entry was posted in Multi Mode Fiber (MMF) and tagged bend insensitive multimode fiber, BIMMF, EF, encircled flux, leaky modes on December 28, 2015 by Alice.Gui. Enterprise data center and cloud operators use multimode fiber for most of their deployments because it offers the lowest cost means of transporting high data rates for distances aligned with the needs of these environments. The connections typically run at 10G over a duplex multimode fiber pair—one transmit (Tx) fiber and one receive (Rx) fiber. Upgrading to 40G and 100G using MMF has traditionally required the use of parallel ribbons of fiber. While parallel transmission is simple and effective, continuation of this trend drives higher cost into the cabling system. However, a new generation of multimode fiber called WBMMF (wideband multimode fiber) is on the way, which can enable transmission of 40G or 100G over a single pair of fibers rather than the four or ten pairs used today. Now, let’s get close to WBMMF. What Is Wideband Multimode Fiber? WBMMF is a new multimode fiber type under development that will extend the ability of conventional OM4 fiber to support multiple wavelengths. Unlike traditional multimode fiber, which supports transmission at the single wavelength of 850 nm, WBMMF will support traffic over a range of wavelengths from 850 to 950 nm. This capability will enable multiple lanes of traffic over the same strand of fiber to transmit 40G and 100G over a single pair of fibers and to drastically increase the capacity of parallel-fiber infrastructure, opening the door to 4-pair 400GE and terabit applications. 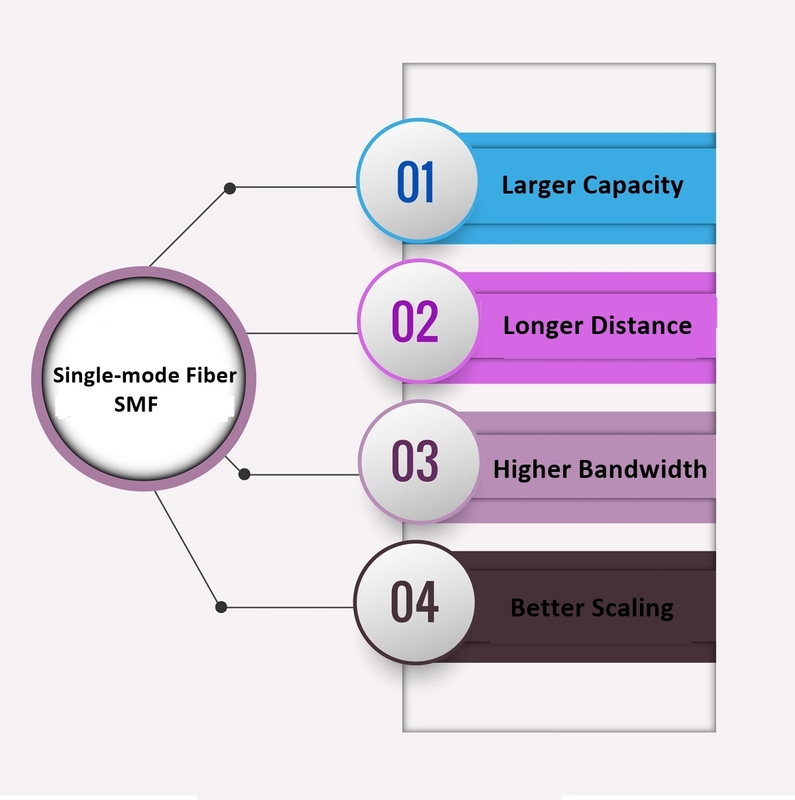 Multimode fiber continues to provide the most cost-effective platform for high bandwidth connectivity in the data center, and with the launch of the WBMMF solution, that platform has been extended to support higher speeds with fewer fibers and at greater distances. What Is the Technology Behind WBMMF? WBMMF uses short wavelength division multiplexing (SWDM) to significantly increase its transmission capacity by four times. WDM technology is well known for its use in single-mode transmission, but has only recently been adapted for use with vertical cavity surface-emitting lasers (VCSELs), which have been proven in high-speed optical communications and are widely deployed in 10G interconnection applications. SWDM multiplexes different wavelengths onto duplex MMF utilizing WDM VCSEL technology. By simultaneously transmitting four VCSELs, each operating at a slightly different wavelength, a single pair WBMMF can reliably transfer 40G (4x10G) or 100G (4x25G). The use of SWDM then enables WBMMF to maintain the cost advantage of multimode fiber systems over single mode fiber in short links and greatly increases the total link capacity in a multimode fiber link. Why Does WBMMF Make Sense? In order to increase transmission speeds up to 10G or 25G, transceiver vendors simply increased the speed of their devices. When 40G and 100G standards were developed, transmission schemes that used parallel fibers were introduced. This increase in fiber count provided a simple solution to limitations of the technology available at the time. It was accepted in the industry and allowed multimode links to maintain a low cost advantage. However, the fiber count increase was not without issues. At some point, simply increasing the number of fibers for each new speed became unreasonable, in part because the cable management of parallel fiber solutions, combined with the increasing number of links in a data center, becomes very challenging. Please see the picture below. Usually, 40G is implemented using eight of the twelve fibers in an MPO connector. Four of these eight fibers are used to transmit while the other four are used to receive. Each Tx/Rx pair is operating at 10G. But if we use WDMMF, two fibers are enough. 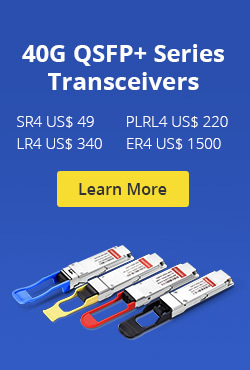 Each Tx/Rx pair can transmit 40G by simultaneously transmitting four different wavelengths. This enables at least a four-fold reduction in the number of fibers for a given data rate, which provides a cost-effective cabling solution for data center. WBMMF is born at the right moment to meet the challenges associated with escalating data rates and the ongoing need to build cost-effective infrastructure. Besides, WBMMF will support existing OM4 applications to the same link distance. Optimized to support wavelengths in the 850 nm to 950 nm range to take advantage of SWDM, WBMMF ensures not only more efficient support for future applications to useful distances, but also complete compatibility with legacy applications, making it an ideal universal medium that supports not only the applications of the present, but also those of the future. This entry was posted in Multi Mode Fiber (MMF) and tagged Multimode Fiber, OM4 Fiber, singlemode fiber on December 5, 2015 by Alice.Gui. Pick up any cabling catalog, and you may locate a variety of components and associated buzzwords that you never dreamed of. Including patch panel, wall plate, plenum, modular jacks, raceways, fiber optic pigtails and patch cords are only a few. Exactly what do all of them mean, and just how are these elements used to create a structured cabling system? In this blog, we’ll provide some information about the structured cabling system so that you won’t feel so confused next time you select up a cabling catalog or assist professional cabling installers. Today, we mainly explain the cable components relevant information. If you wish to find out about components, pls visit FiberStore Tutorial, we provide some detail information regarding the fiber optic components. We’ll describe the constituents involved with transmitting data from the work area towards the telecommunications room or enclosure. These major cable components are horizontal cable, backbone cable, and patch cords used in cross-connections and then for connecting to network devices. The terms horizontal cable and backbone (sometimes called vertical or riser) cable do not have anything regarding the cable’s physical orientation toward the horizon. Horizontal cables run between a cross-connect panel in a telecommunications room and a telecommunications outlet located near the work area. Backbone cables run between telecommunications rooms, and enclosures,as well as the main cross-connect point of a building (usually found in the equipment room). The photo illustrates the standard components seen in a structured cabling environment, like the horizontal cable, backbone cable, telecommunication outlets, and patch cords. Fiber patchcord can be used in patch panels to supply the link between field-terminated horizontal cables and network connectivity devices (for example switches and hubs) and connections between the telecommunications outlets and network devices (including computers, printers, as well as other Ethernet-based devices). They are the part of the network wiring you could see. As the saying goes, a sequence is merely as strong since it’s weakest link. Due to their exposed position in structured cable infrastructures, patch cords are nearly always the weakest link. Whereas horizontal UTP cables contain solid conductors, patch cords are created with stranded conductors because they’re more flexible. The flexibility allows them to withstand the abuse of frequent flexing and reconnecting. Although you could make your own field-terminated patch cords, we strongly suggest against it. The manufacture of patch cords is quite exacting, and even under controlled factory conditions it is difficult to attain and guarantee consistent transmission performance. The first challenge lies inside modular plugs themselves. The parallel alignment from the contact blades forms a capacitive plate, which gets to be a source of signal coupling or crosstalk. Further, the untwisting and splitting of the pairs as a result of the termination process raises the cable’s susceptibility to crosstalk interference. In the event that weren’t enough, the mechanical crimping method that secures the plug towards the cable may potentially disturb the cable’s normal geometry by crushing the conductor pairs. This is another supply of crosstalk interference along with a source of attenuation. Tip:Patch cords which were factory terminated and tested are required to achieve consistent transmission performance. At first, patch cords seems to be a no-brainer, nevertheless they could possibly function as the most important element of accurately specify. When specifying patch cords, it’s also possible to require your patch cords be tested to make sure that they fulfill the proper transmission-performance standards for category.For more information about fiber optic patch cable types or want to buy the patch cable, pls contact this email: sales@fs.com. This entry was posted in Multi Mode Fiber (MMF) and tagged Fiber optic patch cable types, fiber optic pigtails, Fiber patchcord on November 6, 2013 by Amelia.Liu.